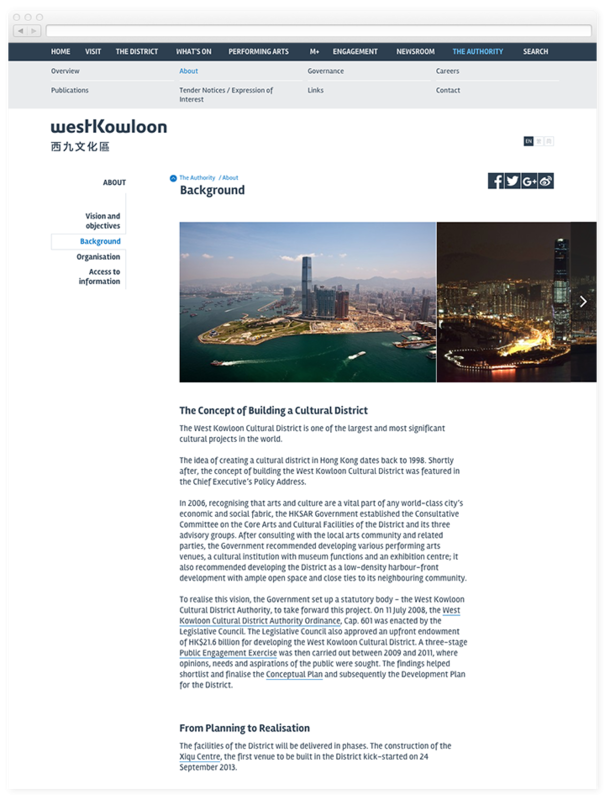 The West Kowloon Cultural District, stretching across 40 hectares of reclaimed land in Hong Kong, is one of the largest cultural projects in the world, blending art, education and open space. This development includes one museum (M+), up to seventeen theatres and performing spaces and a large park, together with residential and commercial spaces. 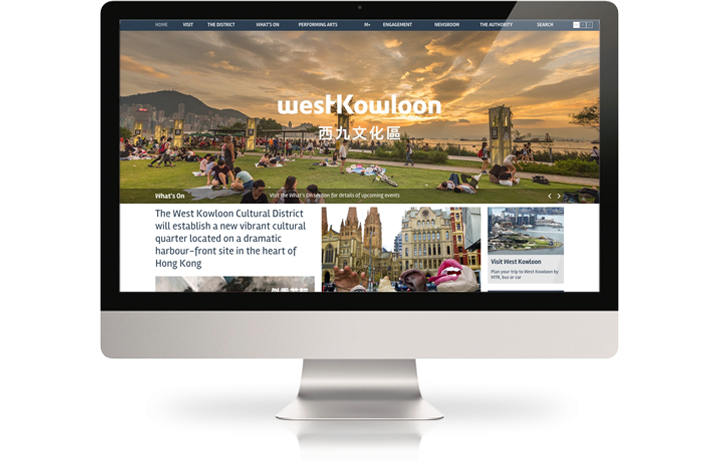 West Kowloon selected Keepthinking to design and build a new, responsive website for the whole complex. The website is based on our Qi Content Management System, that allows staff to easily manage multi-lingual content efficiently and without requiring specialist technical skills. 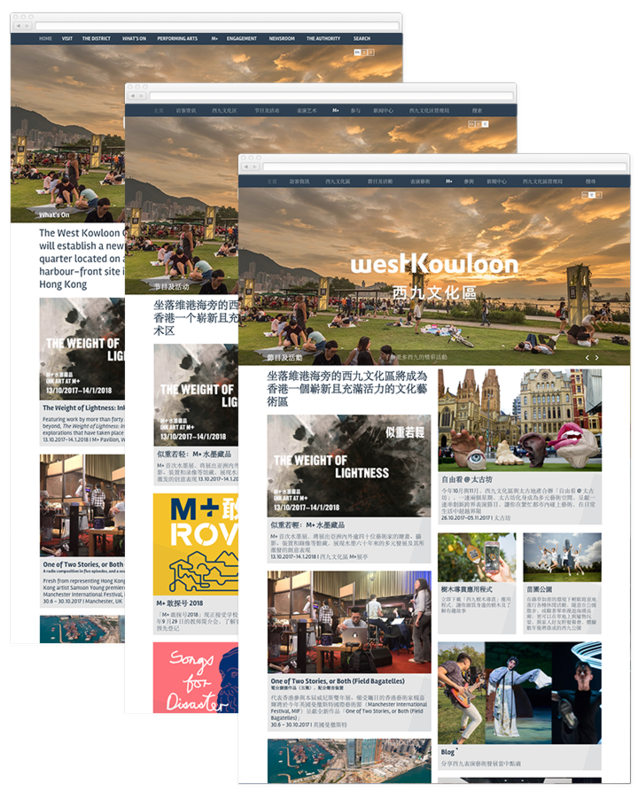 Our challenge was to design and deliver a multi-venue, multi-lingual website within six months. Having a clear project plan is always important but working between London and Hong Kong this was vital. We quickly setup the work team, both at the client as well as at our side; established how to communicate, decided which meetings to have in person or via video conference; agreed the full set of deliverables and milestones, identified dependencies and signed off a solid project plan, that could be monitored by both parties. The website is fully responsive, designed and developed to adapt to different screen sizes and have an optimal layout on desktops, laptops, tablets and mobiles. 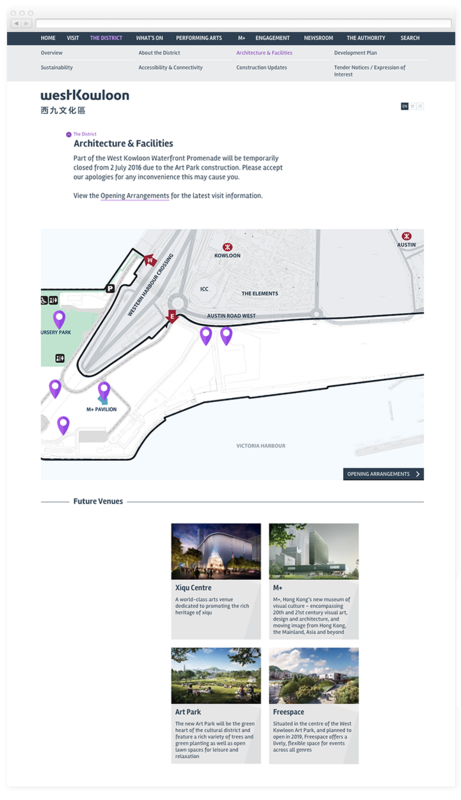 The new website provides an overview of the complex, offers both an overall view of the planning and construction activity, as well as showing detailed information and images about each building. 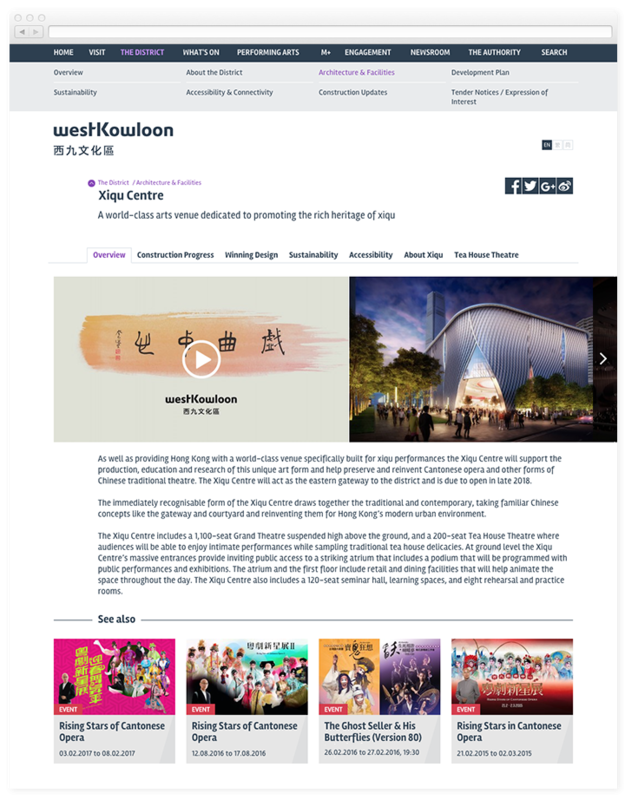 West Kowloon has multiple venues which offer a range a different events, such as Chinese Opera, Theatre, Dance, Music and Art. The website displays all of the venues in a single place and also allows each venue to manage and present its own information, events and pages independently. Events such as concerts, theatre plays, conferences and exhibitions are displayed in both in a the overall What’s On section, as well as on the pages of each individual venue. Multiple categories can be associated to each event and visitors can filter by date, by category and by venue. Events are directly connected to registration, sharing on social media and ticket sales. 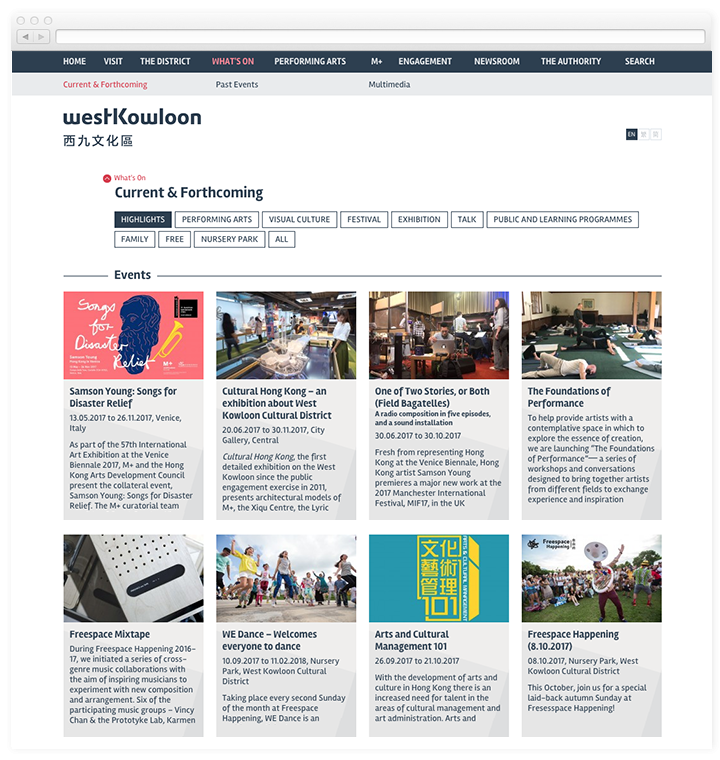 The page layout offers flexible possibilities, such as secondary navigation, images and image galleries in between text blocks, links to other content as well as documents - all controlled via the Qi Content Management System. M+ museum is building a world-class collection of 20th and 21st century Visual Culture. 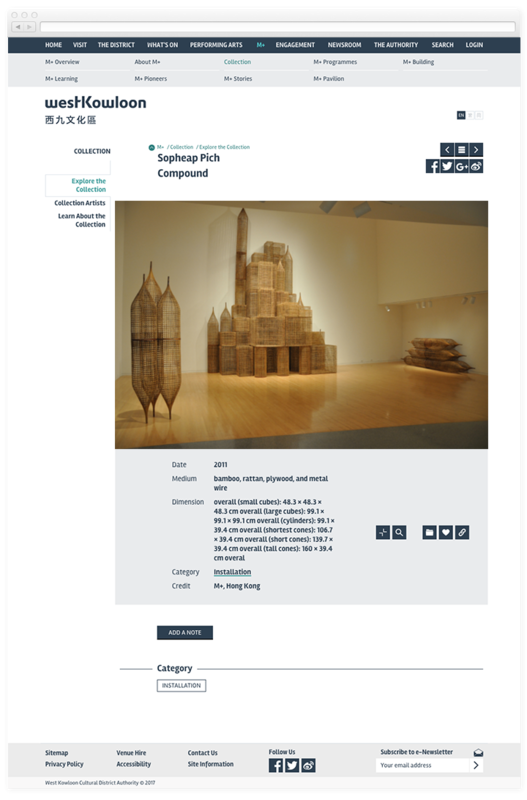 The website allows users to browse, filter and search online for all objects in the collection. Once on a single object, they can zoom on images, add to favourites/portfolios or even add a personal note. The website is hosted on the Amazon AWS infrastructure in Singapore, which is the closest to Hong Kong and China, main markets. Keepthinking has created and monitor a high-availability and fail-proof configuration, based on the AWS cloud, including CDN for distribute asset delivery and combined load-balancing and auto-scaling to take care of spikes of traffic automatically.